Today, the asteroid called 2007 TU24 narrowly missed us. By "narrow," I mean about 85 earth radii--1.4 times the distance of the moon. Of course, there are some doomsayers who think this will somehow negatively affect us. They're wrong (duh). Bad Astronomy made an awesome debunking video. The closest approach has already occurred, but the people at tu24.org don't seem to be letting up. They say they never thought it would hit the earth, and instead think it will cause magnetic disturbance. As it happens, the magnetosphere* is my area of study (mind you, undergraduate research only), and I declare bunk. They claim that the asteroid traverses the magnetosphere. Well, this is difficult to confirm, since the magnetosphere is constantly changing shape. The magnetosphere extends roughly 15-25 earth radii from the earth, but there is also a very long tail that extends away from the sun. The asteroid just might be in the tail region, but I don't see them actually substantiating such a claim with anything other than this diagram they put together. In any case, if it did traverse the magnetosphere, this would be of no consequence. Contrary to their claims, the asteroid is electrically neutral, like all large objects. If it had an overall negative charge, then all the surrounding positive ions in interplanetary space would very quickly be attracted to it until it no longer had a charge. So I just don't know how this rock could possibly have a noticeable effect on the magnetosphere. Furthermore, if it did have an effect, we already would have seen it. It doesn't take that long for waves to travel across the magnetosphere--maybe twenty minutes at most. They throw around ideas like "magnetic reconnection", which is a real phenomenon. But guess what? It's a very common phenomenon that happens all the time even when there is no magnetic activity. Speaking of activity, there was a magnetic storm on November 20. This storm was not, and could not have been caused by a rock. Usually, storms are caused by solar flares and coronal mass ejections. These phenomena are far larger than Earth, and they really do have magnetic properties, since they're made of ionized gas. This gas has no overall electric charge; there are an equal number of positive and negative charges. And yet, do you remember anything happening on November 20? I didn't, and I study this stuff! I only know about it because I checked SpaceWeather. Really, magnetic storms can have negative effects (see Wikipedia), which is why we need to study it. But mostly they just make pretty lights for the people in auroral regions. And these lights are caused by processes that are far less trivial than 2007 TU24. *pronounced "mag (as in magnet)-KNEE-toe-sphere"
According to the powers that be, one of the lab classes I'm currently taking is graded on a curve. This means that a person's grade is determined by how well the class as a whole scores. Whatever the average score, whether it is high or low, it is assigned a B. The lab notebook makes an odd suggestion that grading curves are justified because the laws of statistics are the "laws of common sense". It also suggests that the grading curve is an excellent example of an application of statistics. So let's analyze it! Luckily, they gave us the mathematical tools to know exactly how accurate a grading curve is. If we have a class of 20 students, then the uncertainty of m is equal to σ/sqrt(20). That comes out to an uncertainty in gpa of about 0.22. That's almost a third of a letter grade! If you're a student like me, the words "grading curve" inspire a nebulous fear--what will happen if the whole class is above average? Now, I can tell precisely how inaccurate my grade is. Thanks, statistics! Another justification they used is that this how real life works. Maybe so, but I'm betting that real life has a sampling size larger than 20. *gpa is the grade point average. A gpa of 4 is an A, a gpa of 3 is a B, and a gpa of 2 is a C.
This is a classic puzzle that often provokes lively discussion among puzzling communities. We start with an empty bag at 11:00. We put in 10 billiards balls, which are numbered 1 through 10. But then we take out the ball labeled #1. At 11:30, we add 10 more billiards balls, which are numbered 11 through 20, and remove the ball labeled #2. At 11:45, we add balls 21 through 30 and remove #3. This process is repeated infinitely. At each step, the next ten billiards balls are put into the bag, and the lowest number in the bag is removed. There are an infinite number of steps before 12:00, since the time between each step decreases at each step. Obviously this puzzle is meant to be abstract, as you cannot actually perform an infinite number of steps within an hour, nor can a bag actually hold that many billiards balls. But we can still ask a genuine mathematical question about the situation: what's left in the bag after 12:00? Instead of removing the lowest numbered ball in the bag at each step, we instead remove the highest numbered ball. So on step 1, we remove #10, on step 2, we remove #20, and so forth. What's left in the bag after 12:00? On the first step, we add only billiards balls labeled 1 through 9. Instead of adding #10, we just take #1 and paint an extra zero at the end. On the second step, we add numbers 11 through 19, and add an extra zero to the end of #2, resulting in #20. On the third step, we add numbers 21 through 29, and add an extra zero to the end of #3. This process is repeated infinitely before 12:00. What's left in the bag after 12:00? The Carnival of the Godless is up at Tangled up in Blue Guy. They have taken a lesson from Answers in Genesis' new research journal. If they make it look like science, it must have the authority of science! My entry, "How to recursively divide atheists", successfully passed this rigorous peer-review process. I credit my success to the use of such technical words as "recursive" and "satirical". One of the things people like to ask about physics is, "What is the meaning of it all?" What does physics tell us about metaphysics--the ultimate reality behind all that is? Does Special Relativity support Moral Relativism? Does Quantum Mechanics provide a mechanism for consciousness or miracles? Does the Big Bang Theory prove God? No, no, and no. In general, I feel the answer is that, no, physics does not tell us much about metaphysics. Furthermore, people who try to connect physics and metaphysics are often engaged in gross abuse of the science. Much more often, physics only helps us realize how much we don't know about metaphysics. I've already tried to explain Special Relativity (Explained: 1, 2, 3), so I'm going to use it as an example to demonstrate my point. 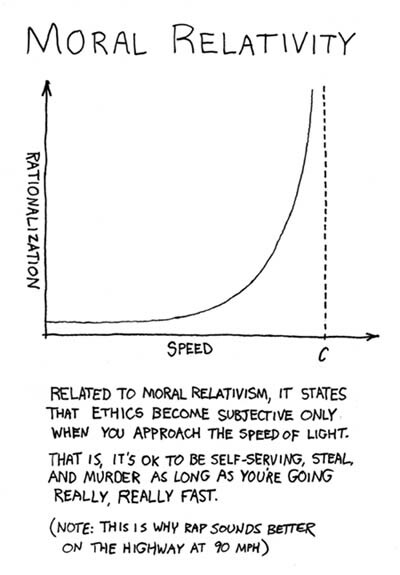 First off, Relativity is not even related to Moral Relativism, or indeed any sort of subjectivist philosophy. They have nothing to do with each other. Yes, Relativity suggests that different observers can have different perceptions of time and space. But "observer" is a technical term that ultimately has no connection to humans, much less human ethical theory. Similarly, the details of time and space have little to do with ethics. If I say that time and space depend on your frame of reference, "frame of reference" is a technical term that depends on your velocity, not your point of view. People seem to think that Relativity tells us, "It all depends on your point of view," but the more accurate statement is, "It all depends on your direction and magnitude of motion." I guess that just doesn't have the same ring to it. Another problem with the idea is that Special Relativity doesn't say everything is relative. Previous to Special Relativity, we used what we retrospectively call Galilean Relativity. In Galilean Relativity, the distance between two objects, and the time between two events would always remain the same, no matter your frame of reference. Time (Δt) and distance (Δx) are what we call "invariants". In Special Relativity, there is an invariant that combines space and time: what we call the "interval". * That means that though space and time are relative, space-time, taken as a whole, is not. Changing reference frames is analogous to rotating a keyboard (only you're actually rotating space-time). You may have changed the positions of the keys, but the shape of the keyboard stays the same. You may have changed space and time, but some things about space-time never change. For example, the speed of light always remains the same. What Relativity does tell us is that our intuition of time and space can be incorrect. Our common experiences bias us towards thinking that time is absolute and independent of space, but that's not necessarily the case. Therefore, if you want to philosophize, you should be careful about your assumptions about time and space. If you want to talk about the cause of the universe, you should be careful with ideas like "before" and "after", since these concepts may or may not exist independently of the universe. Furthermore, in these matters, I think it is irrelevant whether Relativity is in fact true. Relativity is just a heads-up to philosophers to be careful with hidden assumptions. Ideally, philosophers would realize this without science's help, but whatever it takes. Why's it so quiet? Does everyone agree with absolutely everything I say? I find that unlikely and undesirable. So can I ask for comments? Let's start here. Use this thread to ask me any question! Or you can just say hi or something. We start with the divide between atheism and religion. Atheists think there is no god. People with religion disagree. Simple enough, right? Well, things are really not so simple. See, there are two types of atheists. Most people like to divide atheists into "good" atheists and "bad" atheists. The problem with this is that people disagree on which is which! Nevertheless, it is clear that there is a real divide. To describe it objectively, one kind of atheist prioritizes being friendly, while the other side prioritizes being outspoken. The latter group is variously described as the "new atheists", the "militant atheists", the "atheist fundamentalists", the "angry atheists", the "outspoken atheists", or the "uppity atheists". The former group is mostly referred to as either the "friendly atheists" or the "appeaser atheists". Is it obvious who uses which labels? The difference between these two groups has little to do with their opinion of god, and everything to do with their opinion of those who believe in god. How should we behave towards religious people? Should we slap them around the face and tell them they're delusional? Or should we hold hands, and sing? You must choose one, or so I'm told. So now we have not two, but three sides in the debate. We could also split religious people in the same way, resulting in no less than four sides. But wait, there's more! We can pick any of these sides, and further split it into two. For example, take the "friendly atheists". They agree on god, and they agree on how to behave towards religious people, but do they all agree on how to behave towards the "militant atheists"? There are those who rebuke the militant atheists, and those who accept them as partners in activism. Are those militant atheists popularizing the cause, or is their shrill tone alienating everyone? As a second example, take the "outspoken atheists". They agree on god, and they agree on how to behave towards religious people, but do they all agree on how to behave towards the "appeaser atheists"? Are they putting friendly faces on the cause, or are they just appeasing the religious, much like Neville Chamberlain did with Hitler? And so, there are not two, but four kinds of atheists. But this is, so far, an oversimplification of the reality. We can further divide each of these kinds of atheists into two more, each of which can be further divided. For example, take the friendly atheists who rebuke the outspoken atheists. Do they also rebuke the friendly atheists who accept the outspoken atheists? Do they go on to rebuke those who accept those who accept the outspoken atheists? Do the friendly atheists who accept the outspoken atheists choose to accept those who reject the the outspoken atheists? Do they also accept those who reject those who reject the outspoken atheists? All of these questions are of utmost importance! So as you can see, we can easily generate an infinite number of positions to choose from. You must choose one, or so I'm told. How can you not be satisfied by the infinite? It has every nuance that you could possibly want. Battleground God: a quiz that doesn't tell you if you're right, but does tell you if your beliefs are logically consistent. Logical contradictions are fun. The Philosophers' Magazine has a bunch other interesting-looking games/quizzes. Earlier, I wrote spoiler reviews of The Golden Compass and the rest of His Dark Materials. I expected to leave it at that, since I'm not really into movies. But long story short, I ended up seeing the movie. So I feel I should write a review. So, overall, not so great. It's like the Harry Potter movies in that they're glossing over a very complicated storyline, inevitably resulting in quite a few plot holes that would be unexplained had you not read the book. Unlike the Harry Potter movies, most people have not read the books. You might gather that I didn't particularly like the Harry Potter movies, and you'd gather correctly. For example, there is a scene where Lord Asriel gets captured while in the North. The next time we see him, he's in a cabin trying to find a way between parallel universes. I don't remember the book well enough to be able to explain this discontinuity. The whole thing felt a rushed. The scenes seemed to be tossed together in a random order, with little connection between them. It was difficult to keep track of the many characters. The anti-authority theme seemed tacked-on and disconnected from the actual plot. The worst of it was that there was no ending to the movie. Well, I expected this, since the book was the same way. The characters spent the last five minutes explaining what they were going to do, and then it ended. I'm not saying I can think of a better way to have done it, but the end result just isn't so good. You will be further disappointed to hear that it is unlikely that they will actually make the sequel to this movie. The making of a sequel depended on the financial success of the first movie. This movie was not very successful. But then again, Hollywood seems awfully fond of making poor sequels, so you never know. I'm not going to lament the lack of a sequel when they make movies so poorly. As for the anti-religious themes (since that was the focus of my previous reviews), there is not much. Well, the Magisterium is very clearly a fictional form of the Church--you can tell that just from the costumes. It comes off as a little anti-clerical, but this is nothing new in fiction. Seriously, there was about as much anti-clericalism in Happy Feet. This movie was not worth boycotting. Nor was it worth all the hype it got in the blogosphere. Occam's Razor is often considered to be one of the major tenets of skepticism. It has many forms and interpretations, ranging from "Keep it simple, stupid" to "Entities should not be multiplied beyond necessity". The problem is that Occam's Razor can be difficult to justify (depending on which interpretation you use). The most common interpretation I see is that Occam's Razor is a rule of thumb that states, "The simplest explanation is the most likely one". This is useful against all kinds of conspiracy theories and pseudosciences. Which is a simpler explanation: physicists have to this date missed a fifth fundamental force that somehow acts only upon human brains, or that parapsychology studies occasionally have methodological flaws? Which is simpler: that our incompetent government succeeded in organizing a vast conspiracy to fabricate 9/11, or that our incompetent government failed to stop some terrorists? But is it really true that the simplest explanation is most likely? It's not a logical contradiction to say otherwise. And what constitutes a "simple" explanation anyways? One way to justify it is through empirical observation. We observe that simpler explanations are more likely to be successful than more complicated explanations. I'm not exactly sure how you would systematically test this fact, but in any case it's only a rule of thumb. On the other hand, I could point out various counterexamples. Confining myself to physics, I think Quantum Mechanics is not at all simple. Physicists are awfully fond of talking about how simple our fundamental laws are, but in the same breath they declare how counterintuitive Quantum Mechanics is. I don't think it can be both. I think the empirical evidence suffices to justify this interpretation of Occam's Razor. Just keep in mind that it is only a rule of thumb, and it is known a posteriori, not a priori. Personally, I would be extremely careful to use Occam's Razor, and first try other kinds of arguments. Lastly, if you want to apply this to metaphysics, empirical evidence does not cover this region, and you will have to find other justification. As far as I can tell, there is no other justification, aside from the fact that simpler theories are more useful to humans. But the most "useful" theory isn't necessarily the true one, is it? I wrote on a different interpretation of Occam's Razor here. I've already said that I've written puzzles before. Here's one of the easier ones. This one requires a bit of background on how 3D movies work. Two images are projected on the screen, each using a different polarization of light. You are given polarized glasses where each lens has a different polarization. Each eye sees one of the two images, creating the illusion of 3D. A vertically polarized lens filters out all horizontally polarized light. If you turn that lens 90 degrees, it becomes horizontally polarized, and will filter out all vertically polarized light. If you put a horizontally polarized lens on top of a vertically polarized lens, no light can come through. Let's say you're watching a 3D movie. Everyone is wearing an identical pair of polarized glasses. You find that if you close your right eye and look at your neighbor, you can no longer see his left eye. Wait, that's wrong! Are his glasses backwards? Can't figure it out? See my explanation of the solution. Skeptic's Circle #77: The Overmedicalized Edition is up at WhiteCoat Underground. It's filled with great stuff.